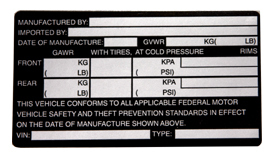 Generic pre-printed labels for typewriters. 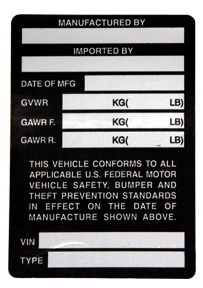 These labels are ideal for low volume Registered Importers (RI's). This label format and material has been pre-approved by the U.S. D.O.T. 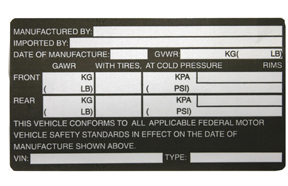 Labels are printed reverse black on matt silver Polyflex� with ultimate permanent adhesive. This adhesive sticks in even the coldest of conditions. MVP & Truck over 6001 lbs.